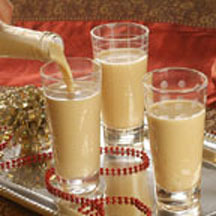 Popular throughout Latin America, this holiday Costa Rican-Style Eggnog is traditionally served at Christmastime and to ring in the New Year. Generously spiked with dark rum and flavored with cinnamon and nutmeg, it is especially festive when garnished with a bit of grated coconut or a sprinkle of nutmeg. For a unique hostess gift, pour the chilled eggnog into a pretty bottle tied with a ribbon. Whisk yolks and sugar together in medium, heavy-duty saucepan. Stir in evaporated milk, cinnamon, nutmeg and cloves. Cook over low heat for 15 to 20 minutes, stirring constantly, until mixture reaches 160º F. (do not boil) and is thick enough to coat a metal spoon with a thin film. Remove from heat. Cover; refrigerate until thoroughly chilled, at least 3 hours or overnight. Remove cloves; discard. Stir in rum. Using a funnel, pour mixture into glass bottle with cap. Keep refrigerated for up to 7 days. Tips: Recipe can easily be doubled. More spices can be added to taste. If you like it sweeter, add more sugar. Nutritional Information Per Serving (1/8 of recipe): Calories: 220 Calories from Fat: 70 Total Fat: 7 g Saturated Fat: 5 g Cholesterol: 105 mg Sodium: 90 mg Carbohydrates: 21 g Dietary Fiber: 0 g Sugars: 21 g Protein: 7 g.